Isn’t it crazy fun when your tastebuds lead you to create an amazing dessert recipe? Caramel apple pie cheesecake was just something I tossed together for a friend one day and it ended up being a HUGE win! Such a big win that I continue to make it to this very day. Psst! I’ll tell you some time-saving tips for this recipe if you’re short on time, but still are craving this no-bake cheesecake! You do have to bake the super-fun crust, but it’s only for a few minutes. After that, no baking is required! I’m a huge fan of no bake cheesecakes because they require less time, less prep and less cream cheese! But I’m kind of a no-bake cheesecake snob. No-bake cheesecake has to be silky smooth and crazy creamy. And it has to have the perfect blend of sweet and sour to make it perfectly perfect for cheesecake fans. Oh, let me tell you what’s so creative and fun out the crust! It’s made of crushed apple cooke crumbs! Squeeeaaall! There’s apple pie flavor in every single bite in this caramel cheesecake. And we make our own caramel for this pie from sweetened condensed milk. And I always prefer to make no-bake cheesecake filling with a KitchenAid Mixer. Call me a mixer snob if you want. I don’t care. Your words won’t hurt me. But if you choose to use a Kitchen Aid for your no-bake cheesecake you’ll see why I’m married to the idea of Kitchen Aid only allowed in my kitchen! And we’ve tried the cookie crust with two types of crushed apple cookies. We’ve used super-cheap no brand cookies and we’ve used pricier, boutique shop cookies. Honestly — it tastes amazing if you go big or go cheap. Totally up to you! 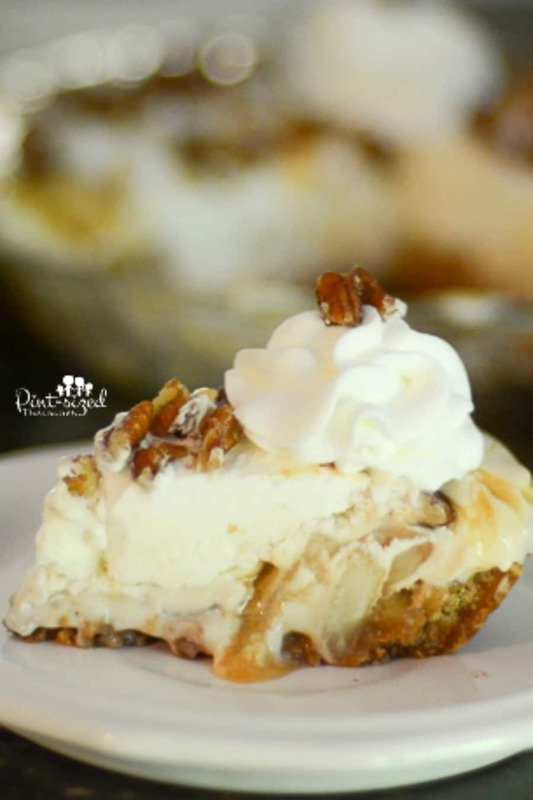 Enjoy this easy caramel apple pie cheesecake that’s perfect for apple pie and cheesecake fans! I love that I don’t have to pick one dessert over another — I can have them both! And before I forget, here are the time-saving tips for crazy-busy moms who are craving apple pie cheesecake! Switch out homemade apple pie filling with the best version of canned. When I make this switch, I choose an organic brand so it’s not overly sweet. Use a prepared cookie crust instead of a homemade crumbled cookie crust. *Use these time-saving tips with caution because homemade and from scratch is almost always the best! 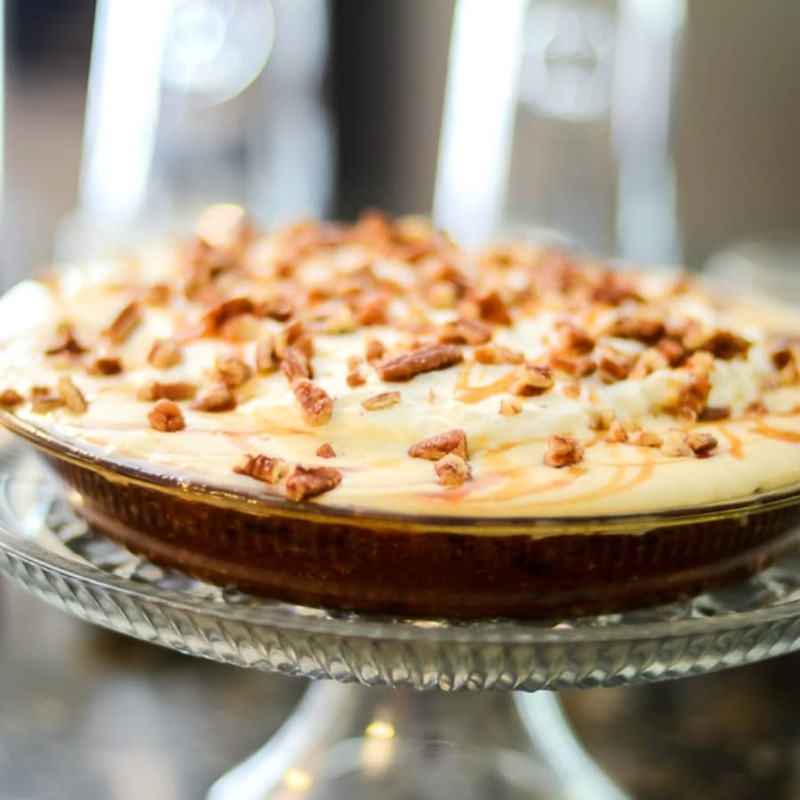 Now get ready to cut into an awesome caramel apple pie cheesecake! Print out the recipe below. 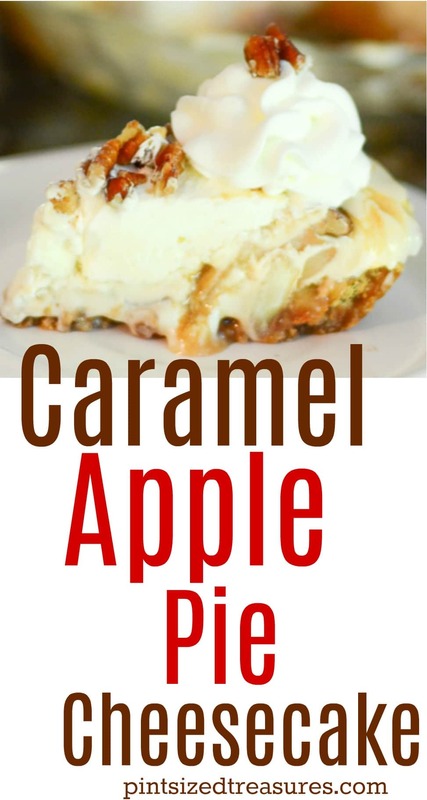 *Affiliate links have been added to help you create the BEST caramel apple pie cheesecake! 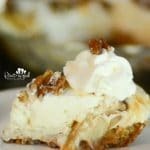 Caramel Apple Pie Cheesecake has an apple cookie crumb crust! Layers of apples and creamy cheesecake are topped with caramel to create a perfect dessert! Stir all ingredients together, except the melted butter. Add in the melted butter next and press into the bottom and sides of the pie plate. Bake this crust for 10 minutes at 350 degrees F.
Gently spoon the apple pie filling into the cooled cookie crust. Then, gently spoon the cheesecake filling on top. Drizzle caramel on top of cheesecake layer. Spread whipped cream on top of cheesecake.